From the brilliant mind of Frank Miller, who brought us Sin City , comes this set of Action Figures based on his epic graphic novel, 300. Written and illustrated by Frank Miller, the story of 300 depicts the Battle of Thermopylae and the events leading up to it from the perspective of Leonidas I, king of Sparta. 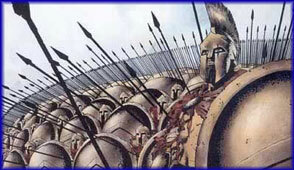 The comic was inspired by the 1962 film, The 300 Spartans , a movie that Miller watched as a young boy.